There was a marked difference in the tone of menswear design in January’s instalment of fashion week. In lieu of the Brexit outcome, the election of President Trump, the general mood of the world was darker, more glum. Its influence was pervasive throughout the collections we saw. 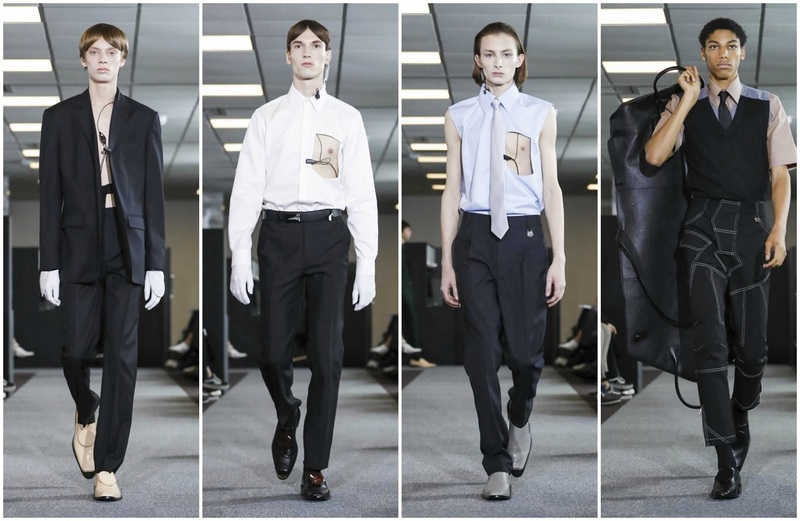 Martine Rose in London, Raf Simons in New York—the two designers championed the investment banker aesthetic with subverted banality, perverted suiting that reflected the men in suits, the dominant forces in society. It was an abridged exploration of the world around us and was distinctly more appropriate than some of the more eccentric creations present at men’s fashion week. 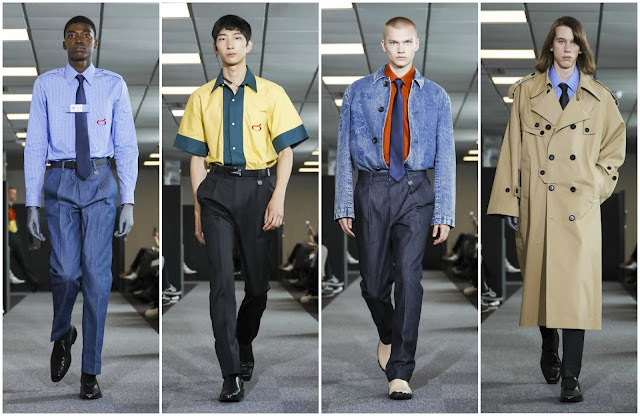 It appeared Xander Zhou—showing on the opening day of London Fashion Week Men’s, the fifth anniversary of the event—pondered similar concepts. His show space was an office block, replete with makeshift partitioning, the smoothly-carpeted grey floors, the bleak fluorescent overhead lighting built into the ceiling. He was thinking about the men in suits, their effect on the world. After binge-watching the latest House of Cards offering, one can’t resist viewing the state of politics cynically; secondly, the exposure to suiting comes at a time when one regularly considers the appearance of politics and politics of appearance. Many of the looks featured a microphone connection… on first glance I thought it was a wiretapped vessel, a symbol of decaying privacy and increased need for transparency but upon closer inspection it appeared to be a bodyguard of sorts—it was a more pointed stab at the notion of protection but it hadn’t been done before. There are only so many times you can view a collection boasting exaggerated proportions positively. In areas he was overly reliant on preconceived ideas of the banality of suiting, ones we’ve been reintroduced to over the past six months. Menswear shunned suiting for a period. For an extended time there wasn’t a tie to be found on a runway from London to New York. However, their resurgence signifies the designers’ disapproval of this epochal shift, where conglomerates rule everything, government officials operate in dubious territories, consumerism is polluting the world. Behind it all? The men in suits. To heighten this visual pursuit, Zhou introduced traditionally urban motifs. The surface of blue trousers were akin to denim; trousers with exposed, stylistically-asymmetric seams gave the impression of what’s beneath, the underbelly of politics; there was also an acid-wash denim jacket with thick black buttons that resembled a traditionally appropriate office attire. It’s a poetically bleak way to look at the world, but with the right styling—Xander Zhou had it—one can expect to be visually arrested by the bluntness of it all. This collection had an urban edge which solidified its success.